Fou Gallery is pleased to announce Han Qin’s solo exhibition Ethereal Evolution from March 30 to May 12, 2019. An artist’s talk and opening reception will be held on March 30, 4–8 pm. Han Qin focuses on and concerns herself with people’s spiritual changes caused by relocation, migration, and other turbulent changes, either as individuals or within a group. Her works are ethereal—light but meaningful—and come in the form of digital art, printmaking, and performance art. The immersive performance Tracking the White Shadow will be held on Saturday afternoons for the duration of the exhibition. Han’s experiences as an immigrant to the United States have driven her to continuously ponder the interrelation between herself and the world, and seeking a dynamic stability among the transfer of her identities. She is interested in issues from international immigration to the origins of human life; thus her artworks lead to diverse themes, such as the confusion of identity, social accessibility, the meaning of travel, and waves of immigration. She utilizes drawing, cutting, and layering to capture the language of the human body by scattering its movement into fragments of moments, frozen. She depicts the passage of time. The sizes and transparency of the figures in her works vary dramatically and render their visual impressions uncertain and changing; meanwhile, the almost monotoned colors and forms in the works overlap and imply the depth of space and the universe, thus raising a profound and abstract contemplation of enlightenment. 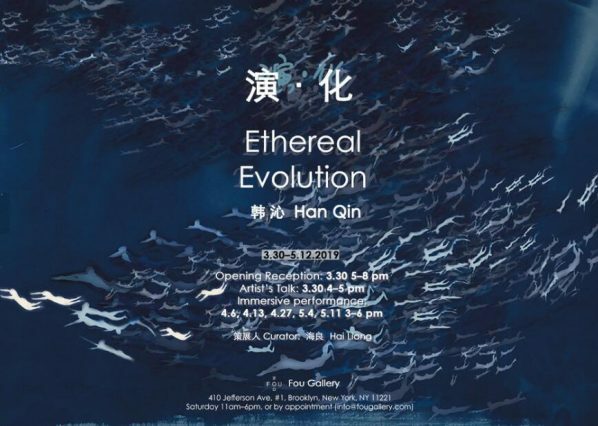 The exhibition features Han’s most recent body of work, Ethereal Evolution. Following the avant-garde tradition, this series includes eight large cyanotypes on paper which involve live performances in their production process. 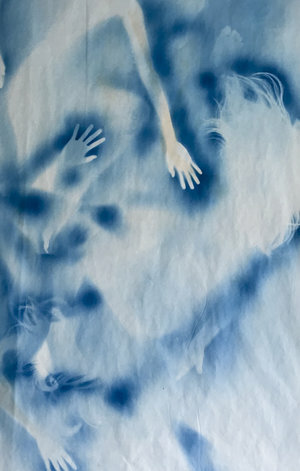 Improvisational dancers perform on the pre-coated Pi Paper and expose their body movements to light. 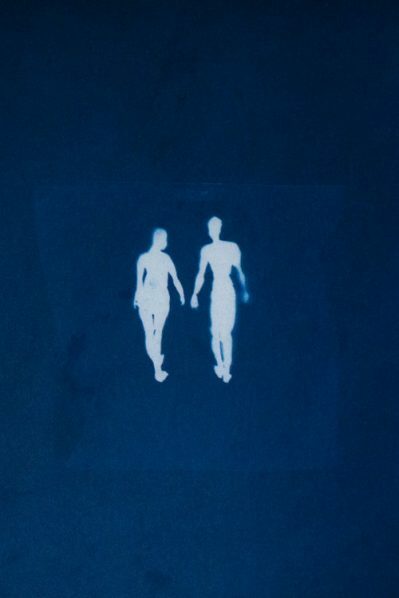 By allowing the action of the light to create silhouettes, ethereal blurry white shadows appear on the blue paper. Tracking the White Shadow, a special immersive performance co-designed by the artist and the curator, will take place during the exhibition. As spring arrives, the sun seems to expand. Dazzling light, moving shadows, the canvas and the performers’ bodies are the elements that constitute the charm of Tracking the White Shadow. The audience will travel through the space as dancers move freely and interact with the paper, and witness the creation of a cyanotype work. The performers enter gently, and the audience naturally blends into it. Their parallel and intertwined relationship begins and ends naturally. That is the art of the time. The performance itself becomes an indispensable part of the exhibition. Fou Gallery also invited Junzi Kitchen’s chef Lucas Sin to curate a culinary experience following the performance. Sin’s practice focuses on the exploration of the change of seasons and the communication between cultures through food. The three-course menu is inspired by the exhibition and enriches the experience. * Immersive performance Tracking the White Shadow. Music: Matthew Barnson’s Vanitas; Performer: Izumi Ashizawa (special guest), Can Wang, Lu (Shirley) Dai, Jingjing Han, and Zhiwei Wu. Special thanks to Amy Yopp Sullivan for her early stage development work, and to previous dancers Wing Kar Chin, Ashtyn Muzio, Lydia Myers, Destiny Terry, and Kelly Smith. Courtesy of the artist and Fou Gallery, for further information please visit www.fougallery.com.